Home, 25″h x 38″w x 44″d; bed sheets, cotton/wool/linen/silk threads, pillow, chair, book, pinecone; staining, laundering, hand stitching. ‘Dialogues’ is a series of work documenting how I am learning about the Pacific North West Douglas-fir ecosystem. While the domestic linens were out amongst the trees I observed biological processes at work on them. I responded to the marks made on the cloth by adding my own stitched marks as directed by my observations. I saw parallels between the stained, fragile domestic linens I cared for and my instinctive urge to care for my family, our home and my environment. 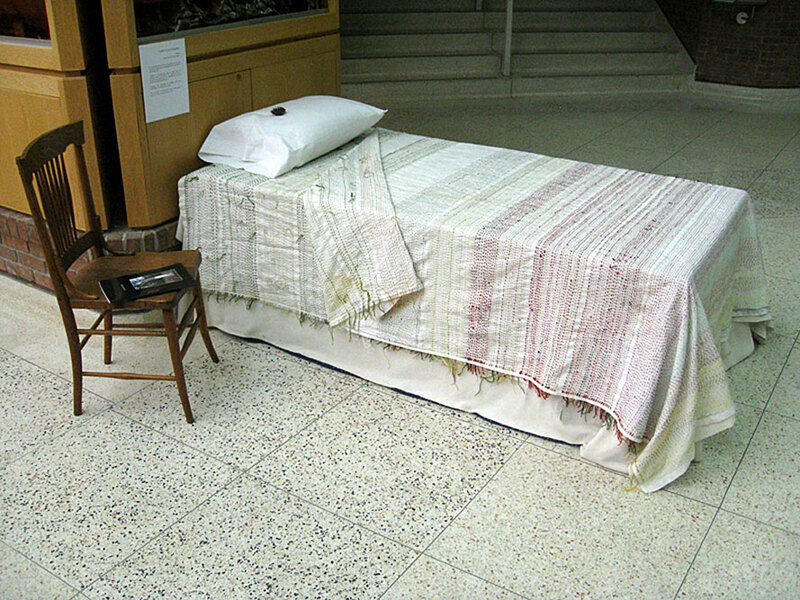 ‘Home’ installed in the Oakville Town Hall, Ontario, Canada, 2012. See more images here. 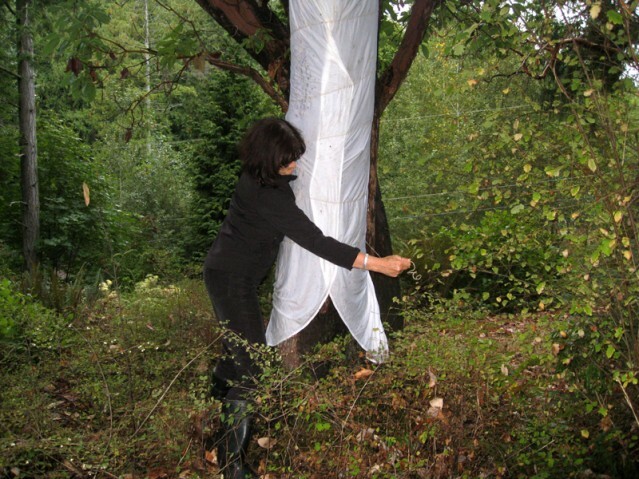 Bedsheets were wrapped around tree trunks and left for a year. The next year with every new moon, I stitched a band in the colours I observed on the tree. Each sheet documents the seasonal cycle of its tree. 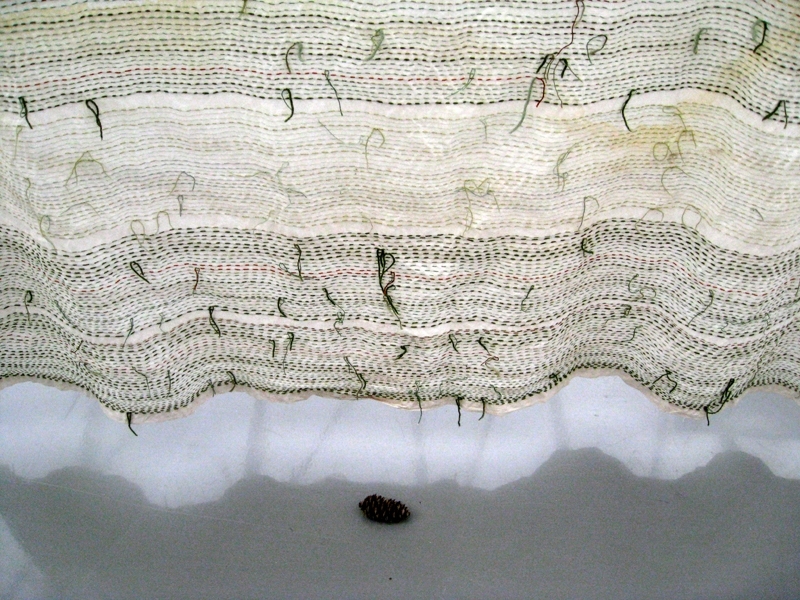 ‘Home’, 142″h x 101″w x 101″d; bed sheets, cotton/wool/linen/silk threads, wood, wire cable, leaf, pine cone, seeds; staining, laundering, hand stitching. The four bedsheets are suspended from a square frame making a house-like structure. Our home is more than the house we live in. Our home includes the natural environment. See more images here. ‘Valuing Women’s Work’, part of the ‘Dialogues’ series, examines women’s drive to make beautiful textiles to protect and adorn furniture, family and friends. Women care for the textiles as they become stained, torn, and worn out from use. The creation and care of domestic linens is a metaphor for the intuitive role women play within their family and their community. Valuing Women’s Work, 62″ x 81″ -installation size variable; table cloth, cotton; composting, laundering, hand stitching. 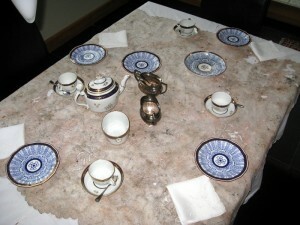 A vintage embroidered table cloth was laid under a maple tree just as its leaves began to fall. After a few weeks, it was stained, torn and beginning to decompose. I carefully washed and ironed it. I laid it on another vintage table cloth and carefully hand stitched the two together, just as textile conservators would do to support the fragile cloth. The stained, repaired cloth continues to adorn and protect. See more images here.